Dr. Christopher Adrian Johnson is an award-winning author and business management consultant. He is a former Commonwealth and Nuffield Cambridge Press Fellow, a Management Science Fellow, a certified Commonwealth Youth Worker, holder of an MBA in Marketing Management and a Doctorate in Business Management. He is also an accomplished visiting Lecturer/Tutor in Commercial English, Employability, Enterprise Research, Leadership and Management Marketing among others. Dr Johnson’s most recent publications are “The Anatomy of British South Asian Enterprise (2016), British Caribbean Enterprises for which he received the Obama Shield (2009) and Britain in Crisis by the late Dr Gurbachan Singh (2010). 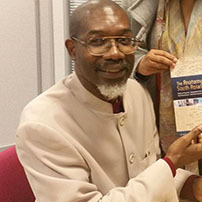 He has also featured in Hansib Publications titles – African, Times, Asian Times and the Caribbean Times in the 1990s. He is a regular columnist of the Phoenix Newspaper and member of the Birmingham Commonwealth Association (Trade and Business Group). The Guyanese-born is also Past-President of the Lions Club of London Hornsey (2004-2005) and a recipient of the Melvin Jones Fellowship (M.J.F) for recruiting female members to serve. A highly respected friend of faith and civil societies, Dr. Johnson who is a practising Buddhist, ranging interests include: reading, writing, research, comparative religion, health/wellness, cooking, travelling, cricket, martial arts, wealth creation and promoting human advancement. His motto is `Excellence is the Fulfilment of the Human Spirit’.